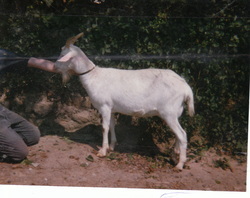 In 1989, in County Wexford, Ireland, I kept my first goats. I bred kids for slaughter and joined the only goat group around. Most people who kept goats did so for milk but readily eat the male kids they had, (or others ate them for them!!). 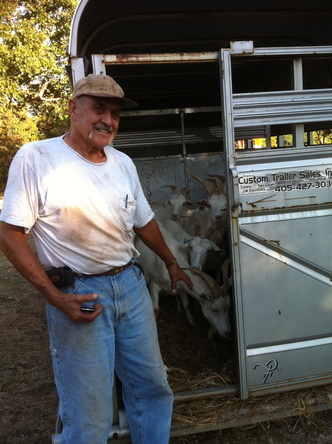 On this page, I would like to outline some of my early interest in goats, my livestock breeding background and comment on the goats I've had at my farm. Irish Goat News: Member publication of the "Irish Goat Producers Association". This is a copy of "Irish Goat News" from September, 1989 when I was a member of the "Irish Goat Producers Association". The association was affiliated with the "British Goat Society". This publication was edited and produced by Zara Brady and was filled with informative goat articles and news about the small world of Irish Goat Breeding. At the time, I was searching for information on goats. Information was more readily available on sheep in Ireland at the time but after leafing through the copies of the News that I still have, I can say that there were many articles which would be useful to many in the American goat production business. and a discussion of management for the control of internal parasites. In 1989, I had a hard time finding good goat feeding and husbandry information and found booklets produced mostly in Great Britain to be very informative and helpful. Being a dairy animal, much study had been conducted about goats, and the art of feeding them very productively had been finely honed. 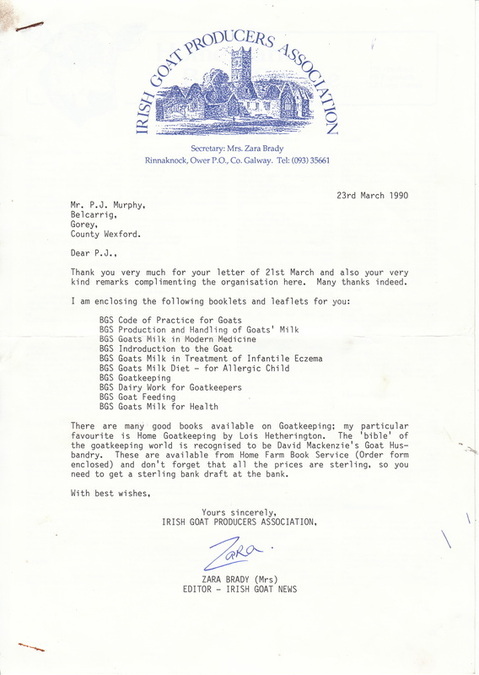 ​On March 21st of 1990, I wrote to the editor of "Irish Goat News", Zara Brady, and inquired if she could guide me in my search for goat related information. ​She was kind enough to type out her reply and include many pamphlets (as listed in her letter). She mentioned "Goat Husbandry" by David McKenzie. It was to be 21 years later that I came to own a copy of "Goat Husbandry". I was given my copy by a goat meat customer who visited my goat meat stall at the local Farmer's Market. She discussed goats with me and said she had a book that she wanted me to have. She brought it by and I was delighted to see it was a hefty and substantial book. It is written in the first person style of many of the books from the middle of the last century. Wexford, Ireland. 1990. I bred the goats early and, if they were managed correctly, they could manage it. These goats gave me the impression that a goat could be hardy. They had to be. I later experimented with full blood dairy goats and found that the feral-cross type I had experience with earlier were more hardy. They were not very productive, however. Little selection for prolificacy or ADG meant mediocre results from the kids for meat production. My father still breeds Irish Draught Horses and their Thoroughbred Cross-Bred progeny - which are referred to as "Irish Sport Horses". The Irish-Sport-Horses then were comprised of various levels of Irish Draught and Irish Thoroughbred crossed - and in more recent times European "Warm" Bloods. The breeding of the Purebred Draughts (which in reality are a more athletic horse than a true draught horse) demands a different focus and set of breeding criteria than does the production of the more sporty and high energy, but higher maintenance, Irish Sport Horse. 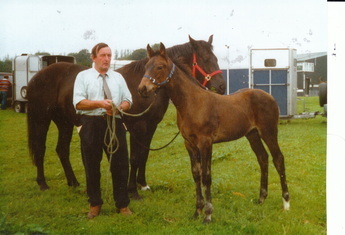 My Father, Aidan Murphy Sr., is pictured here with a Prize Winning Foal he showed in the 90's. The foal was bred from an Irish Draught mare that he also bred. She was one of the highest rated Irish Draught mares in the Ireland at the Registry approval inspections when she was approved for full registry. Through the 90's and continuing until today, my family breeds pedigree sheep and enjoyed much success with them. The first breed to be showed were Blue Du Maines. They are a Maternal Breed with high mothering instincts, vigourous lambs and an active nature. They make excellent brood ewes and the cross-bred Blue Du Maine ewe was an excellent commercial ewe. My mother, Anne Murphy, enjoyed great success with them and showed them and judged them nationally (in Ireland) and internationally. Pictured here is my mother with one of her early Blue Du Maines. ​Later in the 1990's, Texel Sheep became the focus of the sheep breeding program of my family. Texel Sheep were developed in Holland. 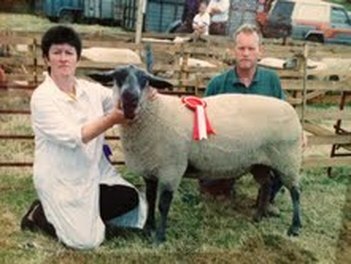 My mother, Anne Murphy, has served as "Chairperson" of the Irish Texel Sheep Sheep Society. She also has been elected to serve as a pedigree sheep breeders (Multiple Breeds) representative to the Irish Department of Agriculture Sheep improvement program called "LambPlus". Those interested in Small Ruminant production should research the LambPlus program. The largest Central Progeny Test in the world in sheep is currently being run in Ireland. The challenges that goat breeders in this country are faced with, are being faced by breeders accross the world. Many of the breeding and management decisions I face every year, are the same decisions that my mother faces in her sheep flock every year and so it goes for breeders of sheep and goats accross the world. The interesting thing is that, in the end, the same principles apply. Especially where sheep and goats are concerned, due to their similar life cycles and diseases and susceptibilities, much is to be learned and new perspectives gained, when discussing and comparing the two. Through the nineties I completed a First Class Honors Degree in Equine Science and pursued an education in the Equine Dental business, which was experiencing a revolution at the time. I traveled and worked in France, England and eventually in California, Kentucky and Florida. I eventually settled in New Jersey and returned to breeding and producing goats as soon as I could. When I returned to breeding meat goats, I went with Boer Goats as a purpose-bred meat breed with excellent conformation, bone and substance. The experience soon went wrong and lack of genetic selection for farmability became apparent. I had a few good boer goats but most had varying degrees of performance related problems. Udder issues; a propensity to have feet that did not handle wet conditions (snow exposure for 6 weeks can be challenging for feet), unenthusiastic mothering (in some lines) and kids that were not active shortly after birth (some lines) were some of the problems. An inability to cope with the heavy worm burden of the hot and very humid New Jersey summers simply led to too many problems for me. 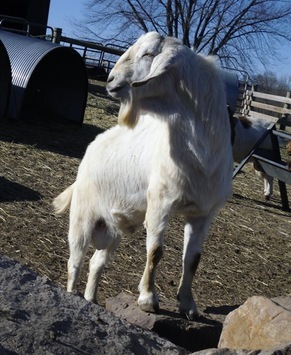 The problem stemmed from the way that I wanted to farm the goats - on pasture when grass is available in New Jersey and stored forage only when not heavily pregnant or rearing kids. Being from a dairy farm, I had seen dairy cows crossed with European meat breeds since my childhood and the resultant cattle were good cattle. We used the older type "British Friesian" dairy cows. They were not as huge or boney as the Holstein Cows ("Cloths hangers" some of the older Irish Farmers called them). The European cattle we used were Limousins and Blonde d’Aquitaines. I thought I would try to replicate that model. The cross between the Dairy goats and Meat goats worked to some degree but both lacked the worm resistance I wanted and the dairy does lacked the physical reserve to withstand periodically poor forage conditions. Surprisingly, many of the dairy does I found had bags suitable for suckling. I tried Savanna crosses but they still were not really what I was looking for. By that time I had started to use some Kikos and they were simply easier to farm and more resilient. After trying the other meat goats, I started paying for Kiko goats and found that the investment paid off in reduced labor and losses. After using Kiko Cross goats, I moving into percentages and then all purebred Kikos as the only goats I would keep. The trouble of keeping different types of goats which can not be treated the same, pushed me to focus on the Kikos more quickly than I had even anticipated. I eventually purged the farm of all the previous goats and started with a clean slate. My numbers of Kikos expanded significantly when I bought out the GIN herd of the retiring Donnie Waller. I bought 64 Purebred (mostly NZ) goats from Donnie. Donnie had started his herd from flushes from 2 heavily line bred Araroa Aristocrat and Tasman Aristocrat does. (See GIN V22 "Premier Dale" and GIN W07 - "Kiwi King"). Those does were flushed using "Cody" and "Dale" as the sires. The investment he made at that time paid off with high quality and powerful goats. When I arrived home with the goats from that trip, it started to rain as I pulled into my yard and it rained 10 inches of rain in a tropical storm that night hitting our area. Not one goat got sick after that almost 3 days of traveling and subsequent soaking. I knew I had the goats I could work with. Donnie Waller is pictured here on the day I picked all his goats up. 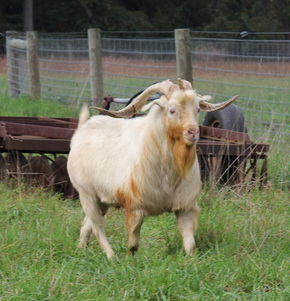 "The doelings I've purchased from PJM Goats have grown very well on a mostly forage diet. Maintained themselves with high famacha scores & required no deworming to date. All PJM Goats are registered with the AKGA and are therefore accepted by all other Kiko Registries.